As some of you might have noticed, there was no blog update this Tuesday. This was because of a short hiatus in between terms. But we are back and working to deliver the best Japanese lessons to the best price. 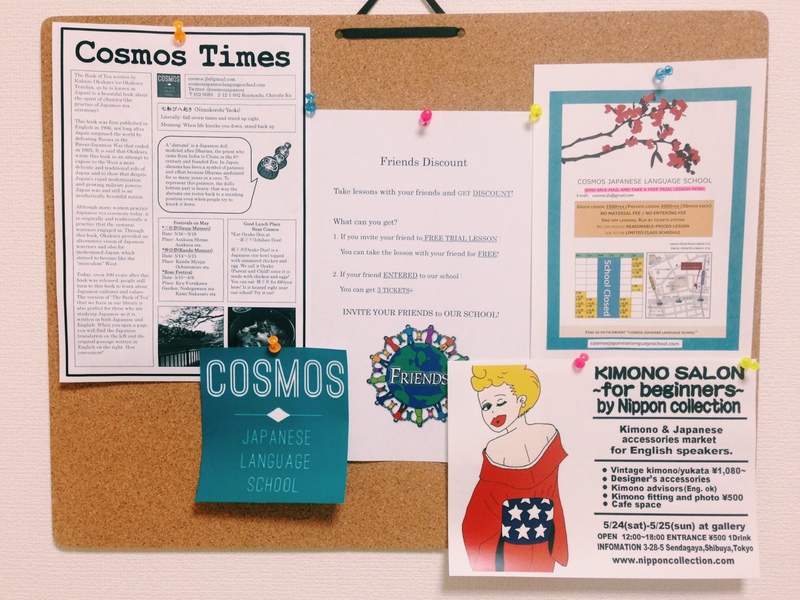 As you all might now, Cosmos Tokyo is a newly started Japanese language school here in Hanzomon, Tokyo. We offer group lessons, as well as private lessons, with a professional Japanese teacher that has many years experience of teaching. We also aim to make these lessons adaptable to what the students feel that they need to review more, or just feel that they are missing in their current studies. We welcome students of all ages, and all walks of life. You don’t have to be a student who seeks to enrich his/her studies. If you are here through work, and have little or no knowledge of Japanese, or if you just wish to refresh your skills, you are welcome to contact us and find a spot that suits you. We also offer preparatory studies for the Japanese Language Proficiency Test (JLPT), all levels. We have some changes coming up here at Cosmos, which we wish to tell all of you about. Mari – A student of management and administration at Keio University. Has been to Seattle one year for her studies. Moto – A student of English Linguistics at Hosei University. Has been to Manchester for one year for his studies. Philip – A student of Japanese, with a degree in Communications and Japanese. Originally from Sweden, he is now seeking fame and fortune in Japan. The schedule will change a bit. Due to popular demand, and because the amount of available slots for classes are diminishing, we are opening up new slots on Wednesdays and Thursdays. We will be updating the website with the new information as soon as possible. Keep your eyes peeled for the latest info.